This is a new printing of the original edition on sturdy, acid-free paper. 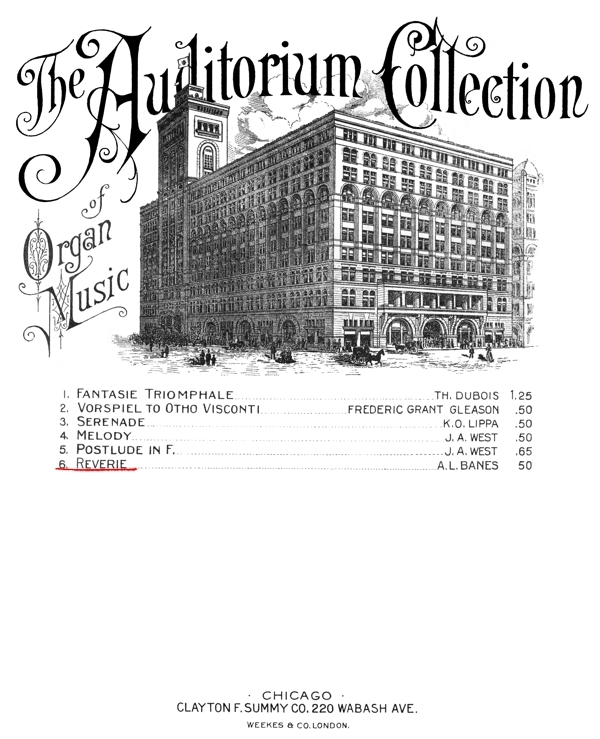 Barnes’s Reverie was Number 6 in a series called “The Auditorium Collection of Organ Music” which celebrated the Roosevelt organ in the Chicago Auditorium. We include a photo and capsule biography by Stephen H Best. 8 pages. Highest quality guaranteed. Size of music is 10.5" x 13.5". $8.00. Albert Lewis Barnes (1861-1906) was born in Illinois but was closely associated with Utica, New York, for most of his life. He was involved with the organ in every aspect from playing and teaching to maintenance and building. (Read Steve’s entire research in this PDF.) This piece published in 1897 coincided with his brief departure from Utica to serve at a church in New Jersey. Sadly, the publisher misspelled his name on the cover. From a memorial concert: “The complete programme will pay tribute to the late Mr. Barnes, who was the greatest musician and did all in his power to uplift the art in Utica.” Moderately easy.